Inking on the Edge: Better late than never BG #11...Edwin caught peeking!!! Better late than never BG #11...Edwin caught peeking!!! Well, I am too late to officially enter this card in the BG challenge # 11 which was to make "one for the boys" but I though I would still share what I made with you! It is yet, another Christmas card with my fav Wassail paper! I hope you aren't getting sick of it!? I have been trying to use some of the stamps that I already own on my Christmas cards. 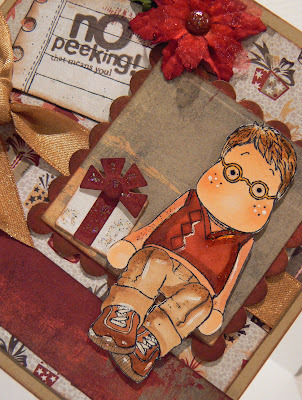 I thought this Edwin, dressed rather dapper and with is cute specs, from the Magnolia Back to School collection, would go nicely with this sentiment!!! I also used the note paper stamp from the Magnolia Back to School collection and stamped the Kelly Panacci sentiment on it. I stamped Edwin on Georgia Pacific paper and coloured him in with my Copics, Twinkling H2Os and white acrylic paint for the highlights. 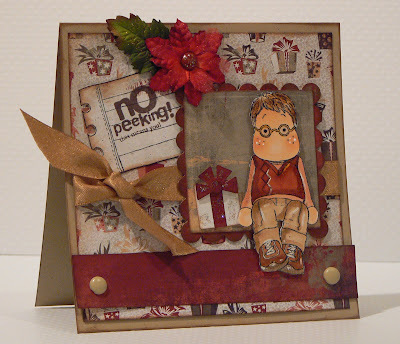 All my cards are made with kraft cardstock and Wassail BG pp, this one is no different. I have been keeping the layouts rather simple so that I can easily reproduce them. I embellished it with American Craft gold ribbon, Prima poinsettias, BG Wassail brads and lots of Stickles. Thanks for stopping by and having a wee peek!!! Oh, by the way, I was just over at the BasicGrey challenge blog and they have a DT call for two DT members. Go check out the deets!!! I think I might give it a go! Oh how sweet is Edwin, brilliant colouring and fantastic card. who could ever get sick of seeing wassail, especially when it is on one of your wonderful creations Tara. What are you doing with these Magnolia kiddies T, they are so naughty, lol!!! Another fab card, great theme! wow lovely car,he's so cute. I have left an award on my blog for you. This card is great! I love how you colored Edwin and the layering is just awesome! oh wow Tara this is adorable ~ Edmin looks so cute and I love all the little extras ~ fabulous !! Oh how sweet does Edwin look? Wonderful card Tara and I could never get fed up of the BG papers...you have done another stunning job with them!